Is your e-commerce website ready? If you sell online, the holiday season is nearly upon you. Here are three items you should review and act on if necessary. Each of them will help you convert visits to sales. You know what your customers bought or didn’t buy in the past. Take a good look at how you are currently presenting your products. It is a good bet that focusing on these three tips will make a considerable difference in your holiday sales. 1. Meaningful Product Descriptions — Do not copy and paste product descriptions from your vendor. Create unique descriptions for each item you sell. Do not shortcut this. Write them for your customer. More, but concise, information means more conversions. Explain what your product is or does and why they should buy it. Help your website visitor visualize using your product. 2. Professional-Quality Photos — It is simple. If you have professional quality products to sell, you need professional-quality photos. iPhones and many Android phones have great cameras, but the person taking your photos needs some photography skills. You do not necessarily have to hire a professional photographer, but you do need photos taken by someone who knows about and will incorporate lighting, simplifying the scene, framing the subject properly, aspect ratio, balancing elements, symmetry, viewpoint, using backgrounds, depth, and colors. The necessity for high-quality photos cannot be overstated. Today’s consumers want more and relevant information about what they buy online. The time you spend on these recommendations will serve you well. Make it a happy holiday season by improving these three areas of your ecommerce website! First Impressions Matter! What Does Your Website Say About Your Business or Organization? What kind of first impression does your website make for your business, community, or organization? First Impressions Matter! Not many of us would argue that. Unfortunately, when it comes to websites, many business owners, as well as community and organization leaders, don’t often think about how they make their first impression. The reality is that the first impression formed by your prospective customer or visitor is not likely to be made when the visitor walks up to your front door. It most likely will be made online, and in rapidly increasing instances, it will be made on a mobile device. Does your website look as professional as you believe your business or organizations is? Does your website look professional on phones and tablets as well as a desktop computer? Is it attractive enough to make the visitor spend some time on it? Can your visitor quickly determine what you offer? Can your visitor quickly find your contact information? Does it convey enough to make prospects want to contact you, or order online? Can they call you with the touch of a button on their mobile device? People are busier than ever, and their time is precious. The reality is, if your website is more than three or four years old, it likely does not meet Google’s current mobile-friendly standards. If that is the case, you are not making a good first impression when prospects see your website on a mobile device. One of the most effective ways of measuring the success of your website is by using website analytics. One of the questions we are frequently asked is “will I be able to tell how many ‘hits’ my website gets?” “Hits” have never been a good measurement. Each file (including individual images on the page and the page itself) sent to a website visitor’s browser from the web server is a “Hit.” Accordingly, each page viewed will generate anywhere from a few “hits” to dozens of “hits.” What most website owners are interested in is the number of “Page Views” and the number of visitors to their website. While these statistics are helpful, there is much more information available that will help website owners or managers measure the success of their website. On every website we create, we install Google Analytics for our clients and provide them access to view their statistics. With over 100 standard reports along with countless custom reports that can be generated, Google Analytics provides more than ample data to help verify traffic in a multitude of perspectives. What and how you measure depends on your purpose for having a website and what you are expecting to achieve. That said, there are some standard Google Analytics reports that are useful no matter what type of website you have. Those include the number of Users, number of Sessions, Pageviews, and Bounce Rate. Here is an example of the Audience Overview report that contains the basic statistics related to the website’s audience. Becoming familiar with Sessions, Users, Pageviews, and Bounce Rate is helpful to anyone wanting to know what is happening on their website. You will see those metrics in many reports. Viewing those metrics from different perspectives can be very enlightening. Acquisition — Knowing how Visitors (Users) get to your website is important. That is especially true if you are paying for advertising. In Google Analytics, under Acquisition > Overview > All Traffic > Channels, you will find the following Channel Groupings. Listed for each of those types of acquisition, you will see all of the data for the audience Sessions, Users, Pageviews, Bounce Rate, and more. You will also be able to drill down in each of the acquisition types, to see more detailed statistics. Behavior — You need to understand which pages Users visit, the number of Pageviews for a given page (and how many of the Pageviews were Unique), how long users stayed on the page, the Bounce Rate, and completion of Goals (if they have been created). The important reports in Behavior, are All Pages, Landing Pages, and of course, Goal Conversions. Conversions — While the reports in this area are arguably some of the most important reports, they all require configuration, and most require editing the tracking code that goes on the pages. For that reason, we will not discuss them here. Of course, we at WebWise Design & Marketing are always happy to discuss how we can help you measure and increase your website traffic. Now that you know you have all of this data available, how will you measure the success of your website? Will it be a specific number of Users (visitors) per month, or number of Pageviews, or Pageviews per Session, Goals completed, contact forms completed (you will see the “thank you” page listed under “All Pages”), sales from products you offer online, or one of many more metrics? Please remember, if you do not measure the results of your marketing, you are not actually marketing. You are simply spending money hoping for a return. Do you measure the success of your website? If not, we will help. So, you truly believe you know who your website audience is. Hopefully, you don’t believe that is enough. You still have to make and maintain a favorable connection with your prospective and current customers. How do you do that? The answer is by using the other 4 Ws as they relate to online marketing. What — Refine what you want to say. Well-written, relevant, and grammatically correct copy is imperative. It doesn’t matter if it is a 1,200-word blog post, a 140-character Tweet, a product description, or a Google AdWords text ad with a 25-character headline and two 35-character description lines. Provide relevance and value. When — The adage, “Timing is everything,” is true. Know when to send your message to your audience. Look at your website and or Facebook analytics to see when most of your visitors are online. If you have a newsletter, check to see when your subscribers are opening your email. Why — Are you trying to . . .
drive traffic to your website? reduce inventory of a particular product? announce a new product or service? build your newsletter subscriber list? The reasons why you are trying to reach your audience affects what you say, when you say it and where it is told. Applying the 5 Ws as they relate to your marketing plan (You do have a marketing plan, do you not?) will reward you for your time spent. After all, simply identifying your audience is not enough. Your Audience and Your Website Visitors – Are They the Same? Who is your audience? That is one of the very first questions we ask our new clients. The answer to that question is something that should be at the forefront of every business plan and marketing decision made for any business. Of course, identifying your audience is not enough. You need to know if your story is reaching them. Many of you are going to say, “Of course, we know our audience” and I will grant it is likely that you do. Assuming you do know your audience, are those in your target audience among your website visitors? Have you checked lately? You do review your website analytics regularly, do you not? Here is a little checklist for you. Are you reviewing the demographics reports? Are your visitors in your target age group? If your target audience is a particular gender, are the majority of visitors that gender? What is the ratio of “new” users and “returning” users? Does that ratio coincide with your marketing plan? Are the visitors to your website spending time on the pages you want them viewing? Where do they go when they leave those pages? Do they leave your website or do they look at more pages? 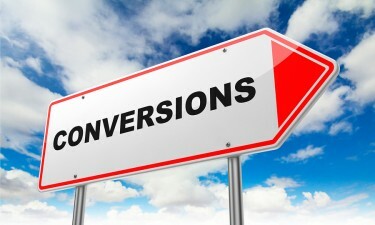 Is your conversion rate what you would like it to be? Are visitors filling out a form or making an order? If you are not measuring, you are not marketing, and if you are attracting the wrong audience, you are not marketing at all! Are those in your target audience among your website visitors? If Google does as stated, today is the day many small business websites disappear from Google Mobile Search Results. Of course, not only SMBs will suffer, but so will churches, associations, and other non-profits. A few major corporations will be surprised as well. We understand the importance of mobile in today’s world. 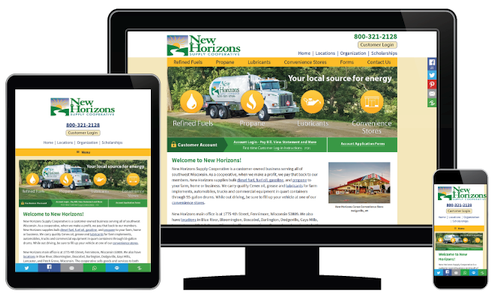 Nearly all the new websites we create are device-responsive, and have a mobile-friendly version, as defined by Google, as well as a desktop version. The vast majority of the websites we have created in the last few years look great and work well on desktops and tablets, as well as phones with “full-browser” capabilities. With smaller devices, the user will have to pinch and stretch some, but they will function. We did create fully mobile-friendly versions for some of our clients websites who chose to be out front in the mobile revolution. Even a year ago a mobile-friendly of a website was a hard sell for us and most other developers, especially those of us who have small businesses and non-profits among our clients. Google seems to think everyone has deep pockets and/or a development team to create exactly the type of website they deem appropriate. They constantly tweak Google Analytics and Google AdWords. Sometimes the tweaks are amazing and time saving. Sometimes they are amazing and very time consuming. Google wrote this Finding more mobile-friendly search results post on February 26, 2015, and followed with this announcement Rolling out the mobile-friendly update today. Here is an excerpt from that post. “April 21st’s mobile-friendly update boosts mobile search rankings for pages that are legible and usable on mobile devices. 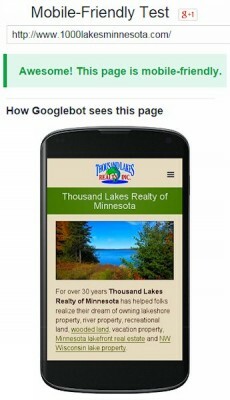 You may check using Google’s Mobile-Friendly Test to see if Google classifies your website as mobile-friendly. It is too soon to know the impact of Google’s latest forced mandate. Every website owner should review their analytics program to see what percentage of traffic is mobile. Remember Google separates tablets traffic from mobile, as most tablets display the desktop version of a website. Once you determine the percentage and number of mobile visitors (and what they do while on your site), you will have to decide if having fully mobile-friendly (as defined by Google) is right for your customers and prospects. Only you know what percentage of mobile traffic meets your pain threshold. Please remember that for this purpose, the mobile statistics, are only valid going backwards in time. Mobile search results change dramatically as of today! Improving the most popular pages on your website can increase conversions. Take a look at the pageview data in Google Analytics (or other analytics provider) and make note of the top three pages (other than your home page) visited. You may not have intentionally created the most popular page on your website with the thought of it being specifically a landing page. More likely, it is a page you created some time ago that highlights services or products you offer. It may even be a nearly random blog post you wrote because you hadn’t published one lately. Take a good look at your most visited web page, the time your visitors spend on the page, and where they go after viewing it. Are they filling out your form, subscribing to your newsletter, or calling you? Proof your page again. You may be surprised to find a typo or two. Fix them. If you don’t have a photo or visual, add one. If you are talking about more than one topic, use sub-headers. If you have other pages on your website related to the page topic, link to them. List additional resources at the bottom of the page. If you do not have a “Call to Action” on your page, add one. Improving your most visited pages gives you more chances of increasing conversion rates. Learn more about increasing conversions by calling us today! Don’t feel like talking today? Use our convenient contact form. Twitter is so easy to use, and will pay dividends when used properly, that it belongs in the marketing plan for nearly every business. Here are some tips that will help you use Twitter effectively. Retweet: It is simple. Share what you learn. Don’t tweet all about you. Tweet about others as well. It is fine to tweet the same thing more than once, though do it at a different time of day. Leave enough character spaces for your handle to display if you are retweeted, e.g., @webwisedesign and one space takes up 14 characters, so we have fewer than 126 characters available for our tweet content. If you need help getting started with Twitter, or want to get better at using Twitter as part of your Social Media marketing strategy, give us a call. Is your website, the place you hope to convert prospects to customers, ready to receive visitors? When we use links to our websites using Social Media, we essentially invite people to our website. When we invite people to our homes, we generally check to see if everything is in its place and that there is nothing seriously amiss. Is that true with your website? When was the last time you reviewed your website to see if it reflects your business and your products or services as they are today? Here is a little check list to make sure your website is ready for visitors. Know and state who you are, what you do, and the benefits of what you offer to your visitor. Know who you would like to visit your website. Knowing your audience is critical. If you believe your audience is everyone, you will likely fail. Who are they? Why would they want what you offer? When would they want it? Speak to your visitors from their perspective, not with an industry-speak sales pitch. Explain that you know some of their challenges, and how they can benefit from your products or services. If possible, show some specifics. Does your navigation present a clear and easy path to your most important content? Is your contact and location information readily visible? If your website looks as good as you would like, and you check off all the items in the list, your website should be ready for visitors. 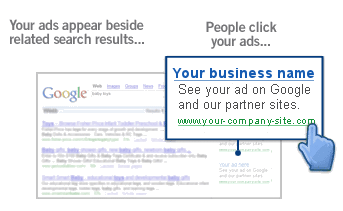 There are many excellent reasons to invest in a Google AdWords and/or a Bing Ads PPC (Pay-Per-Click) campaign. If you have read this blog or talked with us, you know we believe nearly every business should be taking advantage of PPC advertising. If you do nothing else, start a Google AdWords campaign and bid on your business name. Here are a few good reasons why you should bid on your business name. Start doing cost effective branding today by bidding on your business name.